On Saturday night I joined a bunch of entomologists for the 5th Annual Moth Ball in Massachusetts. Lights, sheets, cameras, beer, hotdogs, snacks, and tents for staying overnight. What could be better? I was also on a mission. One species my advisor has been telling me I need to get ahold of is Acronicta hastulifera. 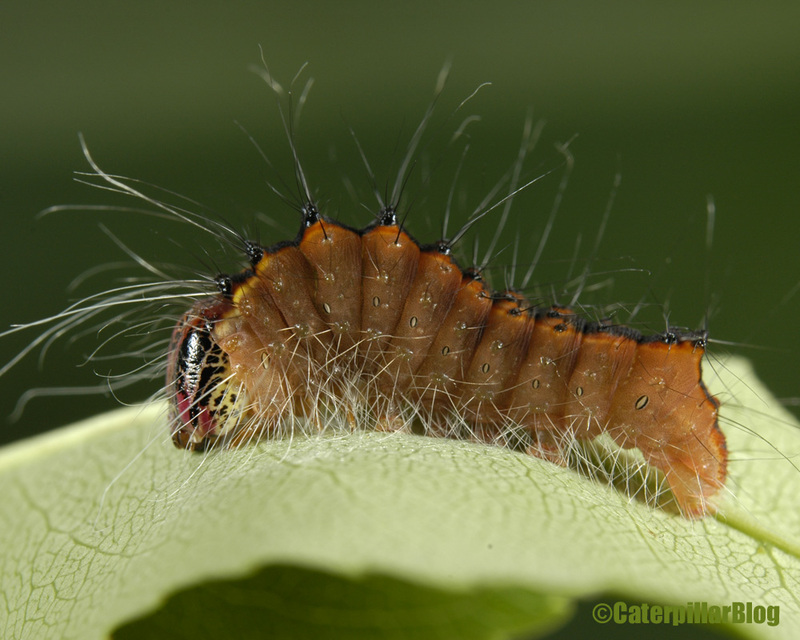 As an adult it is nearly indistinguishable from Acronicta dactylina, though their caterpillars are quite different. 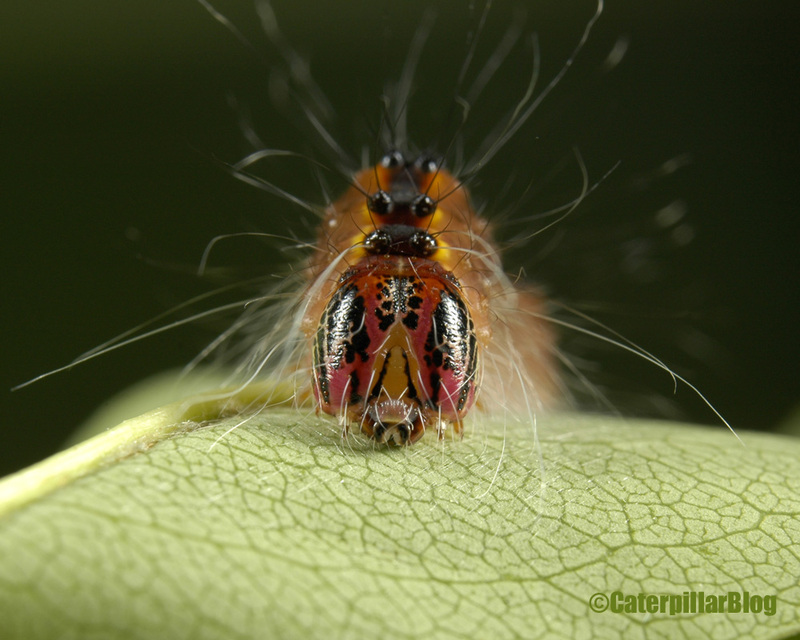 The best way to make an ID, then, would be to catch a caterpillar and rear it to adulthood, or to get eggs from a female and raise the caterpillars. This is not always easy to do. I found a few Acronicta females at the moth ball, nothing terribly exciting. Though it wasn’t long before a friend of mine approached with the grand prize in his hands (from a nearby sheet): Acronicta hastulifera. A big fat female! Success! The rest of the night paled in comparison to that moment. When I awoke in my tent the next morning (after only a few hours of sleep), the first thing I did was check her container for eggs. 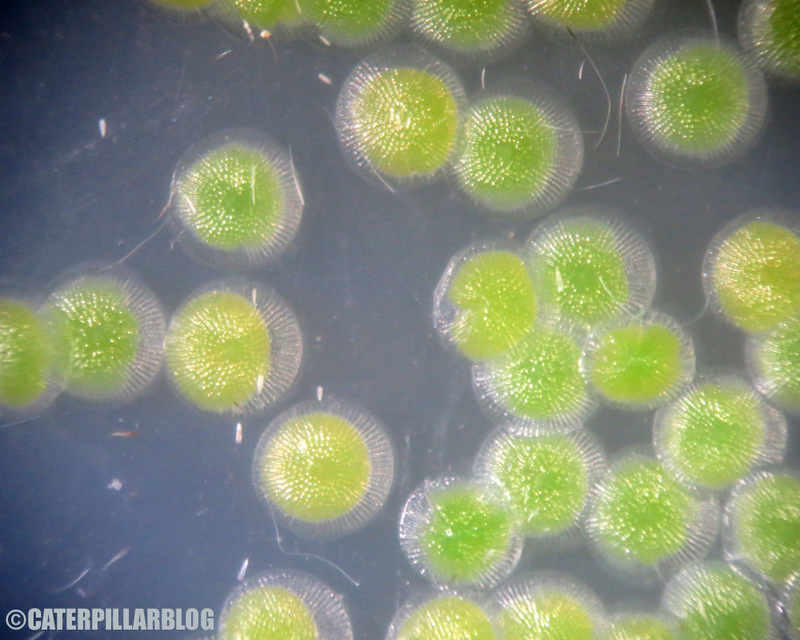 About a dozen big green eggs dotted the sides of the vial. Woohoo! 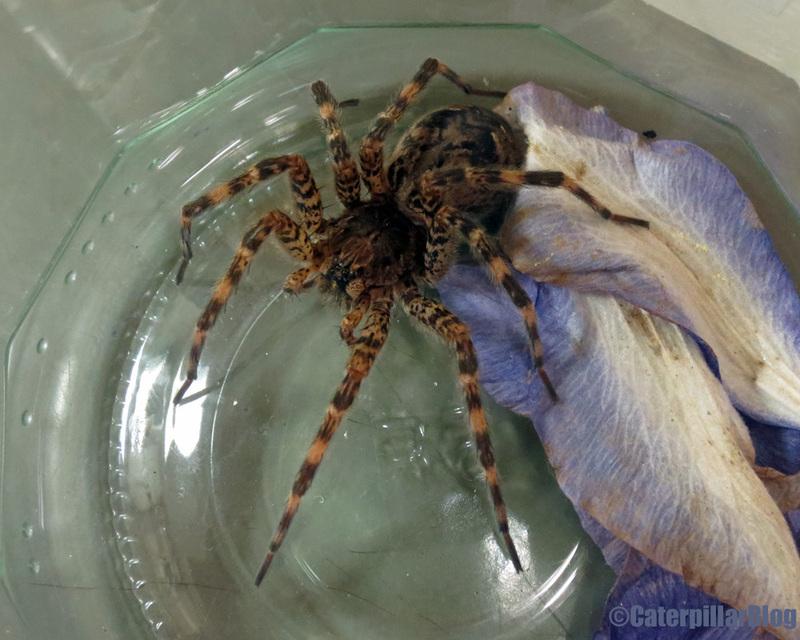 Last night I set her up in a larger container, and she really let loose. I estimate 200+ eggs. Momma moth and some of her eggs. So many eggs! My favorite colors, too! 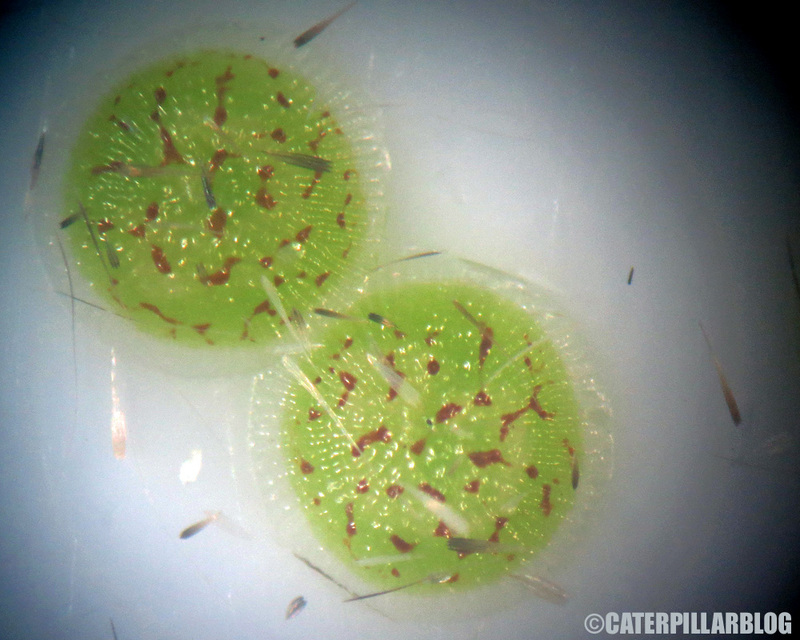 A close-up, taken with my little Canon Powershot through a dissecting scope eyepiece. I hadn’t seen a spot pattern quite like that before (the things on top are the mother’s scales). 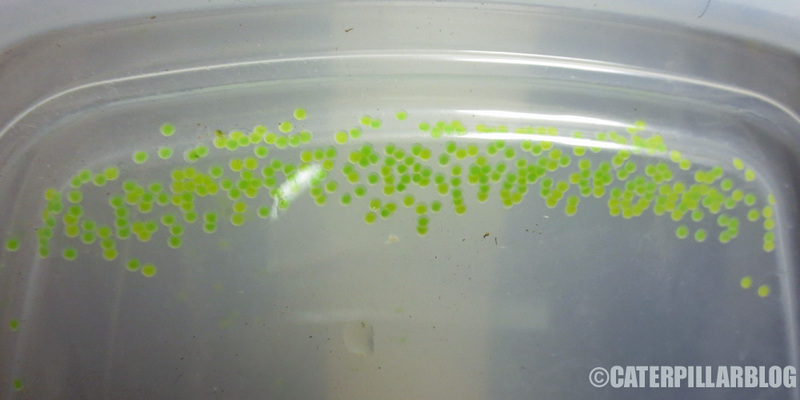 Some of the freshly laid eggs, before gaining their spots. Now I must be patient and wait for them to hatch. 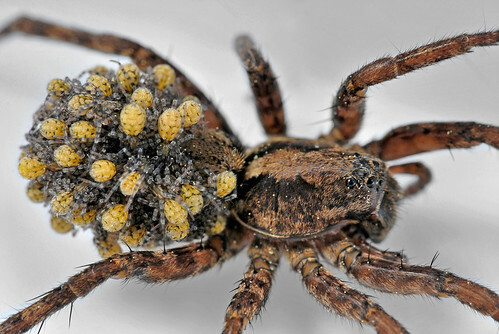 Most Acronicta eggs take five or six days. 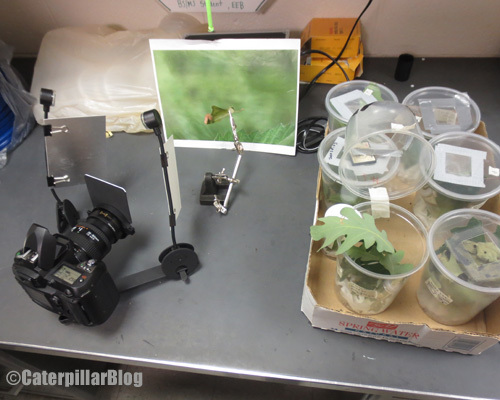 I’ll be ready with some Alder (their favorite food), and my camera to get pics of the little ones. My caterpillar season is starting to gain momentum. 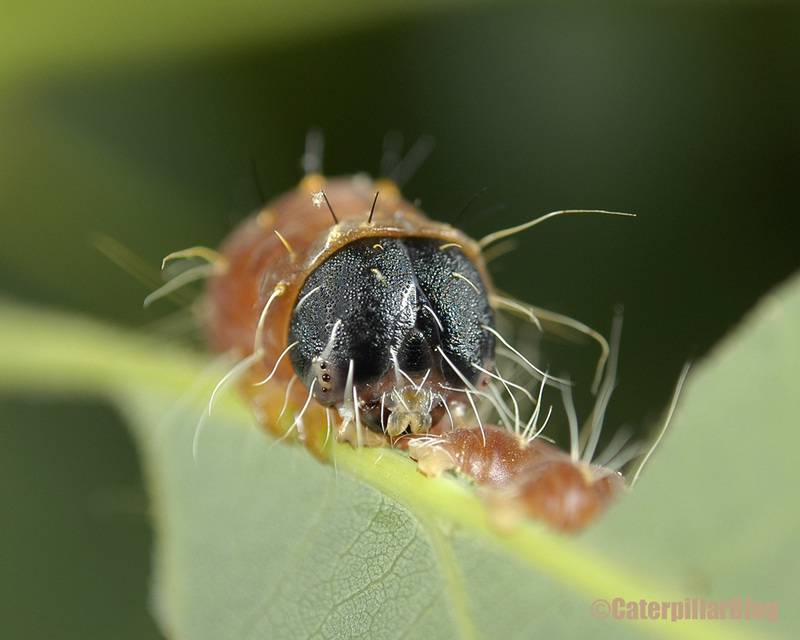 Caterpillars are hatching, eating, growing, pooping. Getting eggs in the mail from collaborators. Running around campus to collect plants. 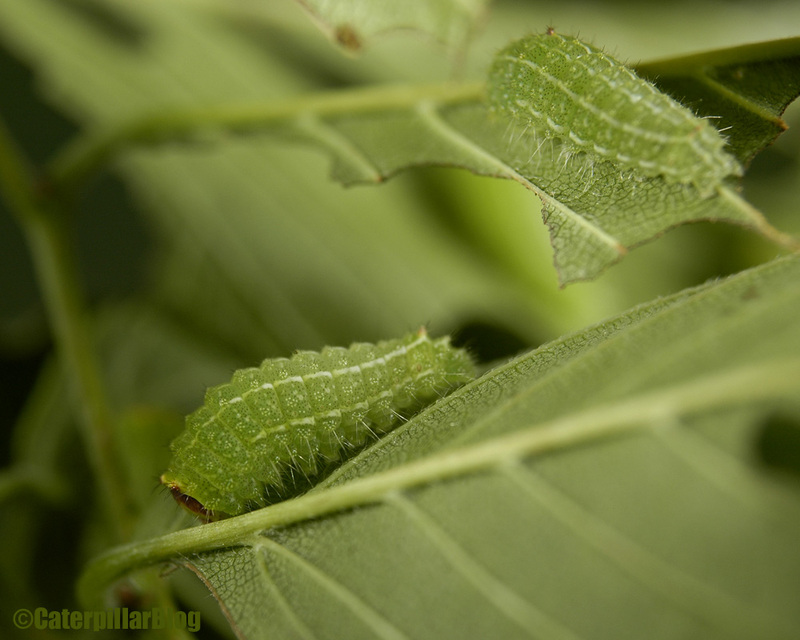 And some of the caterpillars from my Texas trip are approaching pupation. I was somewhat in denial of this fact until I saw the size of this guy. 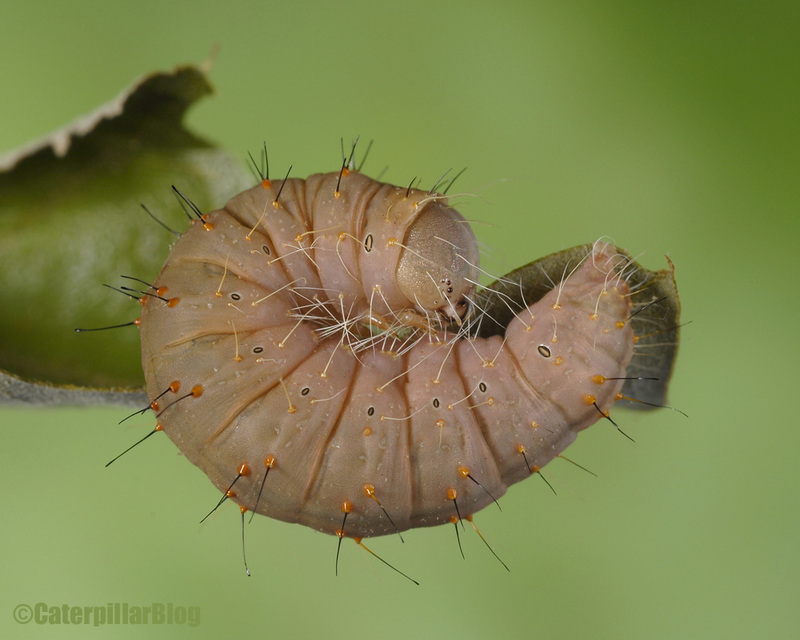 That is a FAT caterpillar! 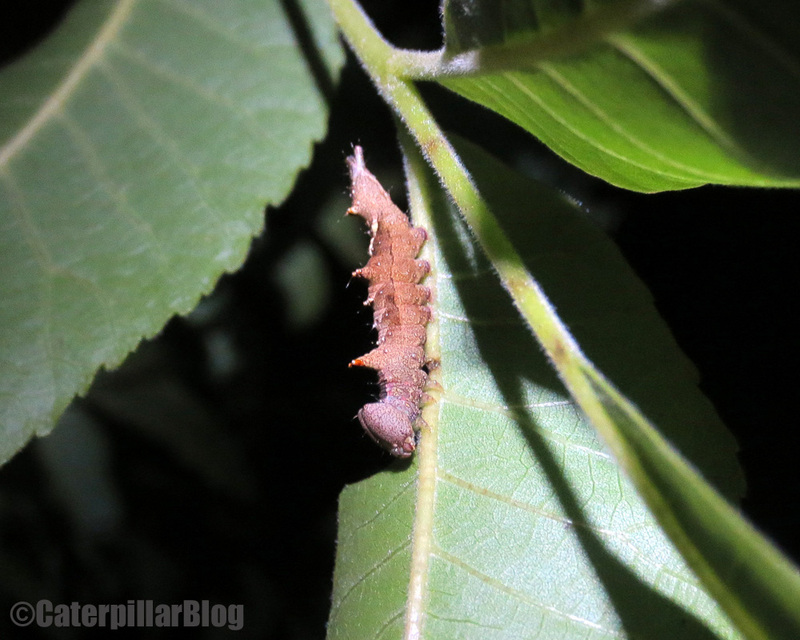 I’d never seen an Acronicta caterpillar look quite so much like it’s going to pop. It also wasn’t in a terribly good mood. This body language is fairly clear. Today I found out why. I checked on Mr. Angry Sausage Caterpillar and it looked a bit… different. The bright reddish orange coloration and jet-black head were an impressive change. I have only seen this sort of change in one other species, Acronicta lobeliae, which also gains a black head and darker coloration before digging a pupal chamber. 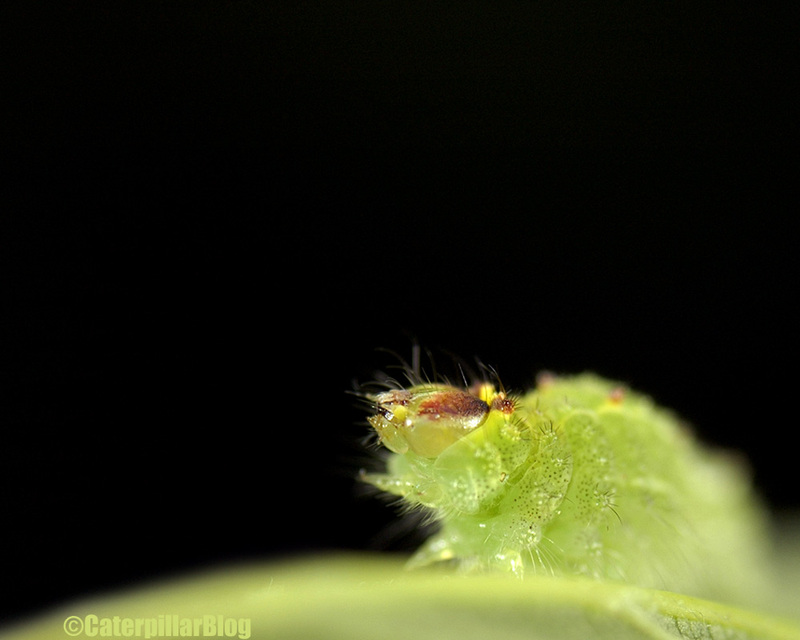 I realized this caterpillar had stopped feeding and was ready to pupate. Poor thing was waiting for the right substrate! 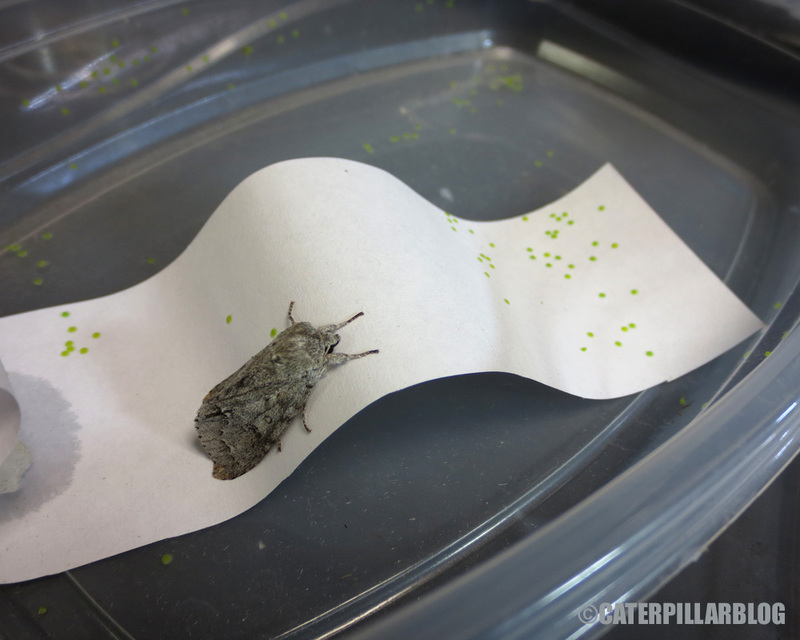 I put a piece of soft, spongy wood into the container, since most Acronicta pupate in wood. It found the wood within minutes, and within an hour had chewed a tunnel into the wood. It’s currently sealed up, where it will remain for a couple months until it is ready to emerge as an adult. I’m still not entirely sure which species this is. 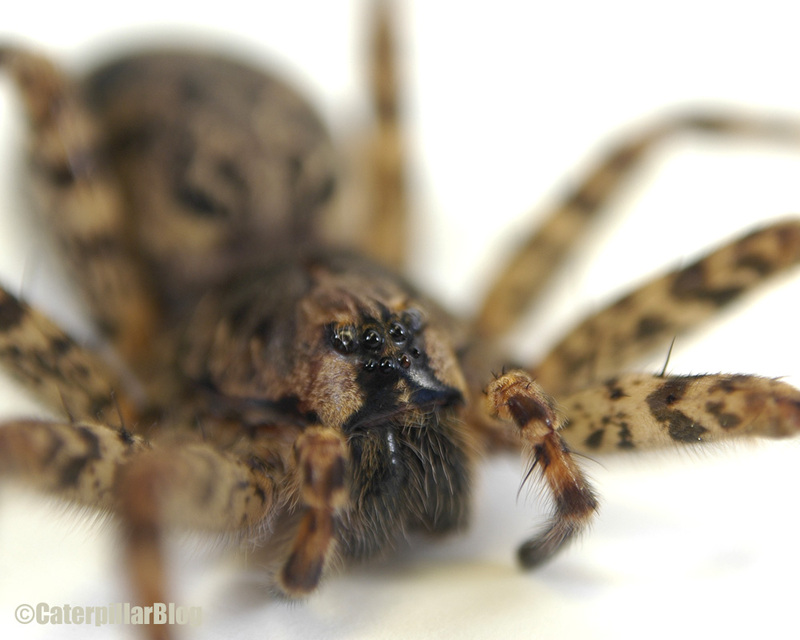 It was collected in Fort Davis, Texas. 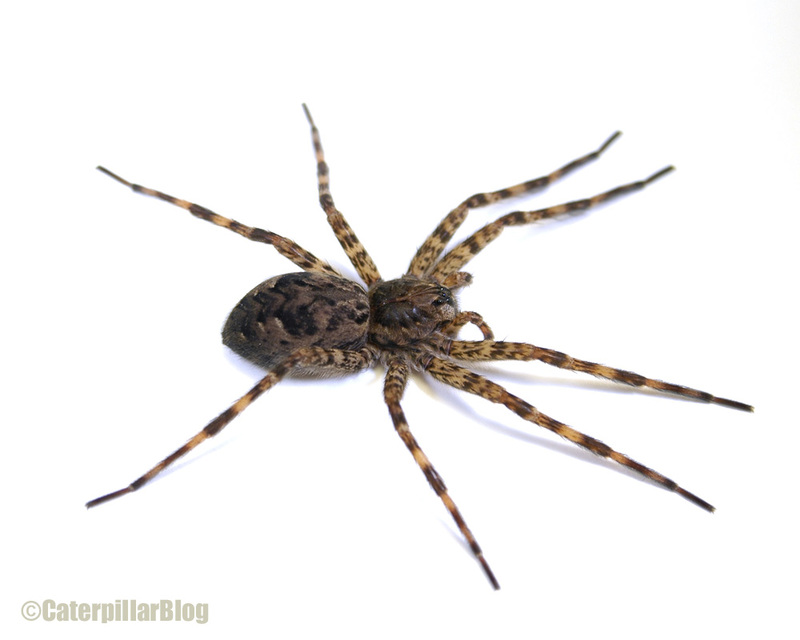 My guesses are either A. afflicta or A. brumosa. What do you think? The goal is for the moths to be attracted to the blacklight, hit one of the metal plates, and tumble through a funnel into the bucket. There can either be a killing agent in the bucket, or the moths can be captured alive (though you’ll want to have some egg cartons for the moths to climb on so they don’t destroy each other by fluttering). 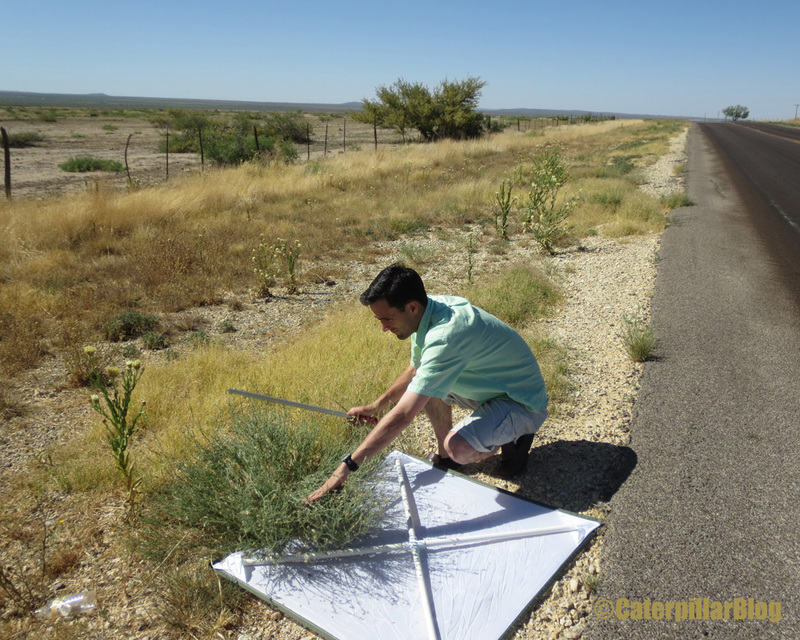 This type of collecting is good for ecological studies, trying to find a rare species, or to attract something that only flies late at night (and you are not willing to stay out that late). I thought a light trap would be useful for my Texas trip, but there was no way we wanted to bring another large box or suitcase. We thought about mailing a trap down to a collaborator, but that would be fairly expensive. Instead we deconstructed a non-functioning light trap we found in a back room, and bought some supplies when we arrived. We brought the acrylic plates, hooks, a funnel, and a blacklight. At Walmart we bought a bucket and a pool noodle, and we were in business. 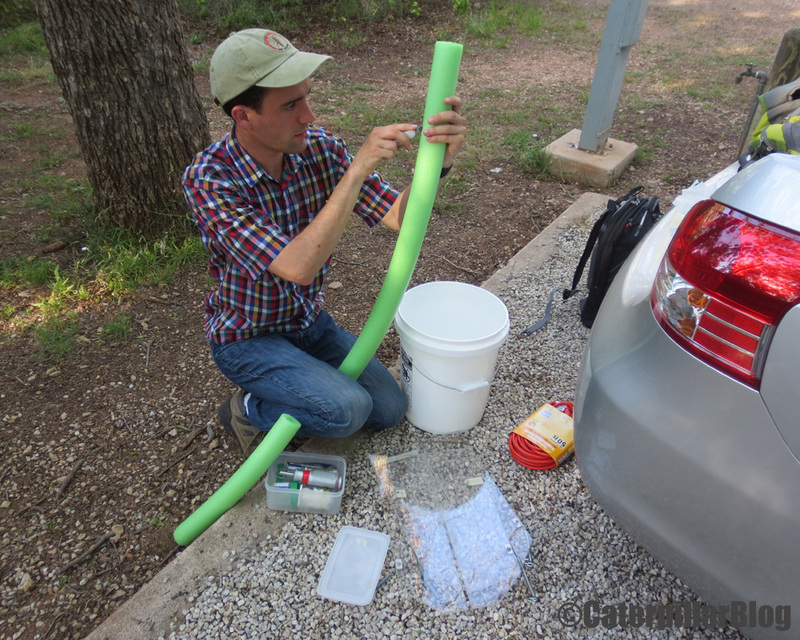 The purpose of the pool noodle was to ensure a tight seal between the funnel and the bucket, so nothing could escape. The battery we bought fit perfectly into a beer cooler, so the whole set up became quite portable and easy to take apart. Success! With access to the right starting materials (acrylic panels, springs and hooks, a funnel and a blacklight) I would do this again in a heartbeat for a long collecting trip. Those all fit easily into a suitcase. At the end we recycled the bucket, left the battery with a collaborator (can’t fly with a battery, sadly), and took the rest of the materials home. 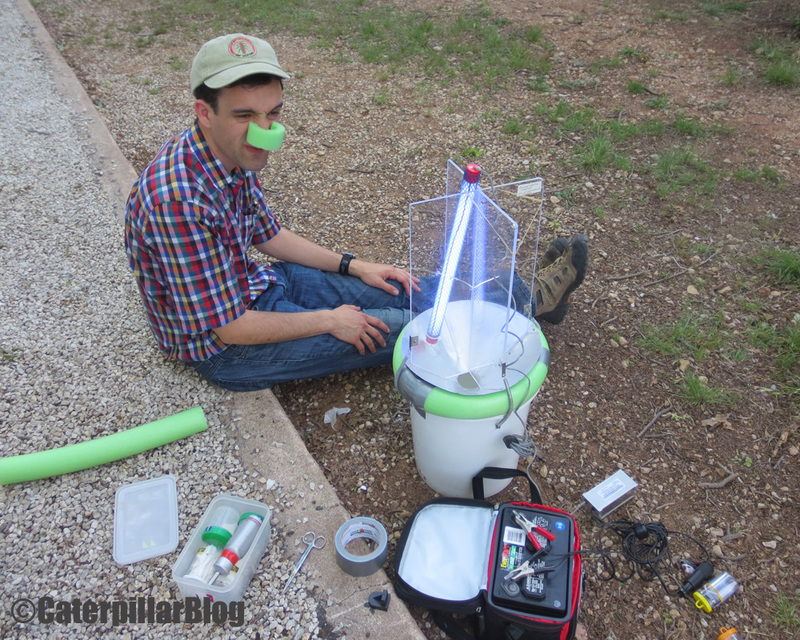 Have you created your own blacklight trap? 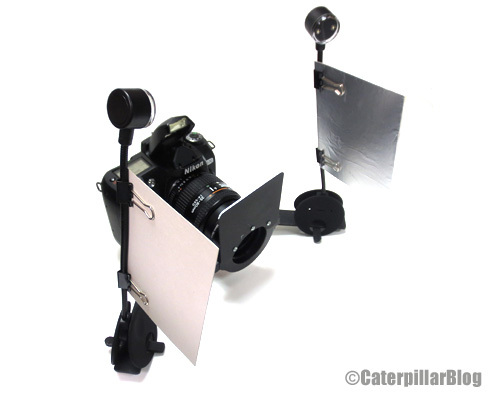 Do you have a design that is easy to take apart and transport? I’d love to get more ideas for next time. To keep costs down, Ben and I decided to camp for the entirety of our Texas trip (aside from two nights at a colleague’s house). This made our trip feel even more adventurous. We’re used to showing up to a research station with dorms, a kitchen, and a laboratory with supplies. This trip was quite different! We brought my tent, and bought some cheap sleeping pads and sleeping bags at Walmart when we arrived. We also bought some batteries to run our lights, and parts to build a light trap. 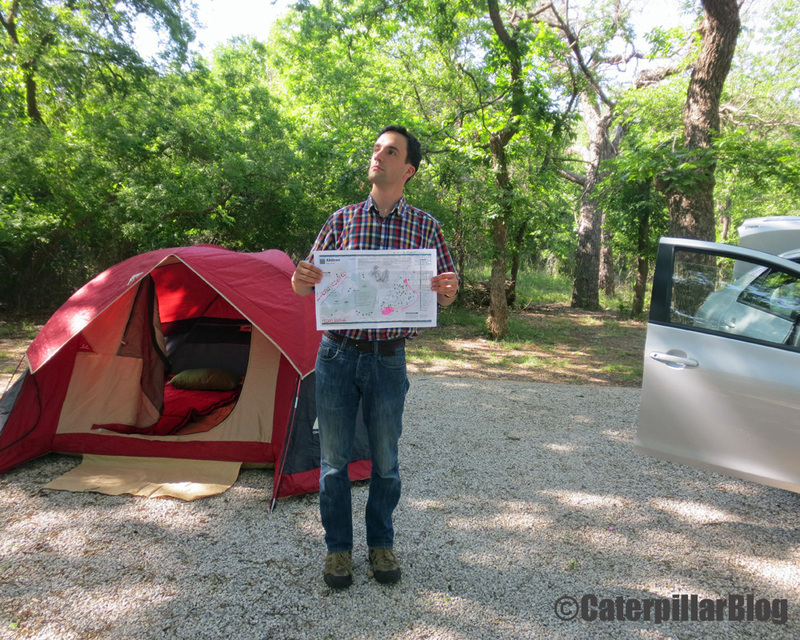 We arrived in Dallas, loaded up the car with supplies and food, and drove out to Abilene State Park. I truly did not believe we would fit all of our supplies into a compact rental car, but we did. The area seemed scrubby, a little dry, and an odd mix of forest, scrub, and almost-desert habitat. The air was hot and humid. There were only a few other people in the campground, as this is not an ideal time to be camping in Texas. As soon as the tent was set up, we set off to explore. 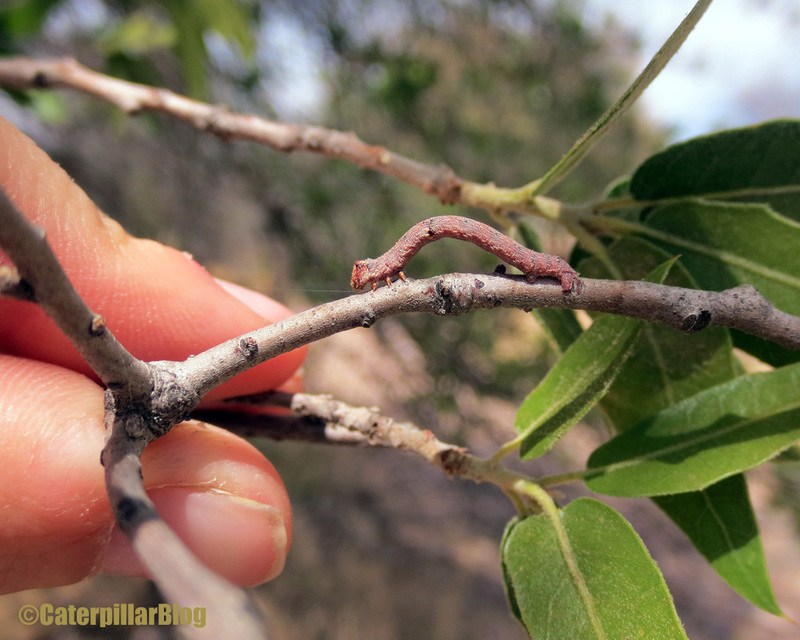 We saw a few caterpillars just by walking around – like this little notodontid. 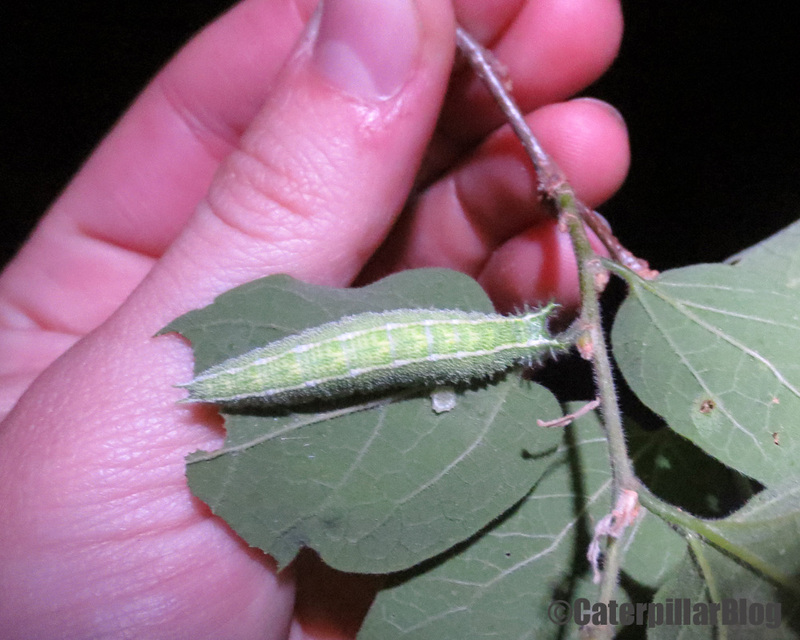 Our daytime caterpillar search wasn’t terribly fruitful though, so we held out hope for the night. 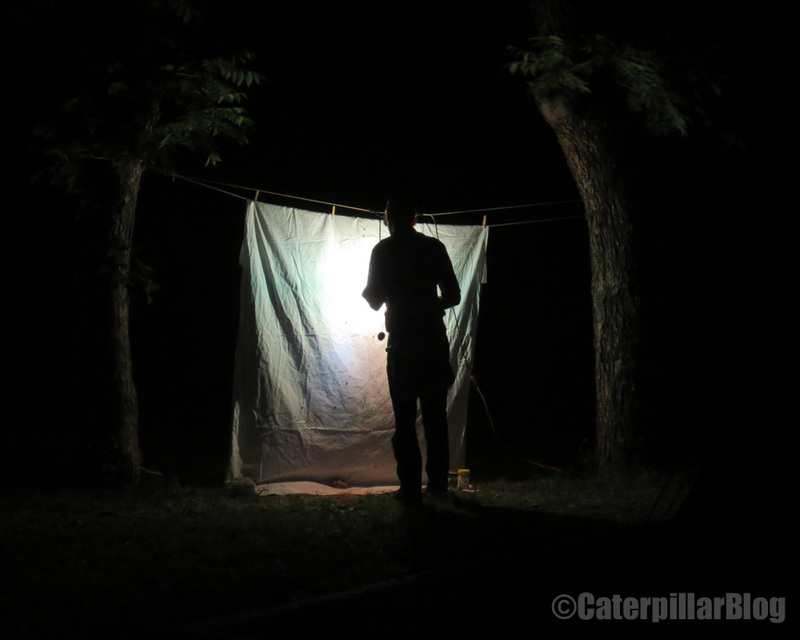 We weren’t too impressed with what the light brought in (our campsite had electricity! 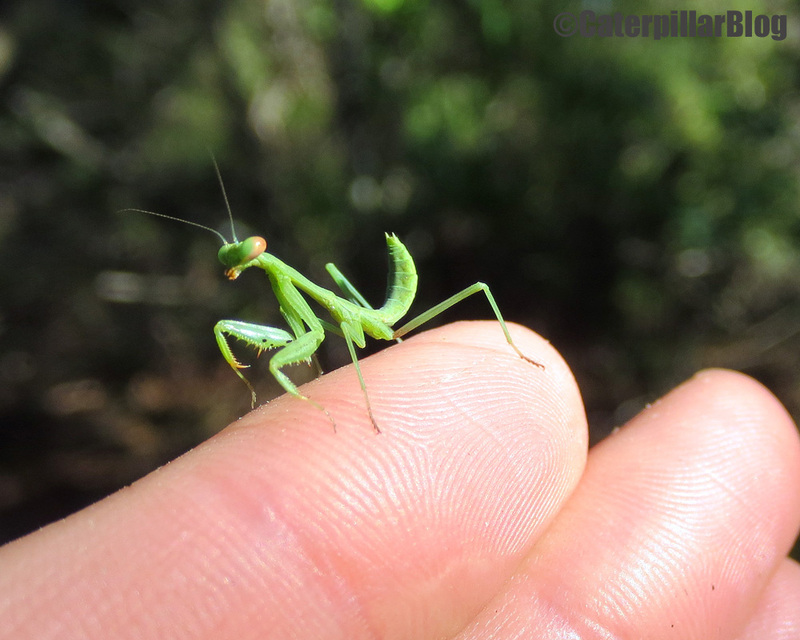 ), but we did have fun (and strained our necks) looking for caterpillars. We were spooked by a few raccoons, but otherwise didn’t run into any trouble. 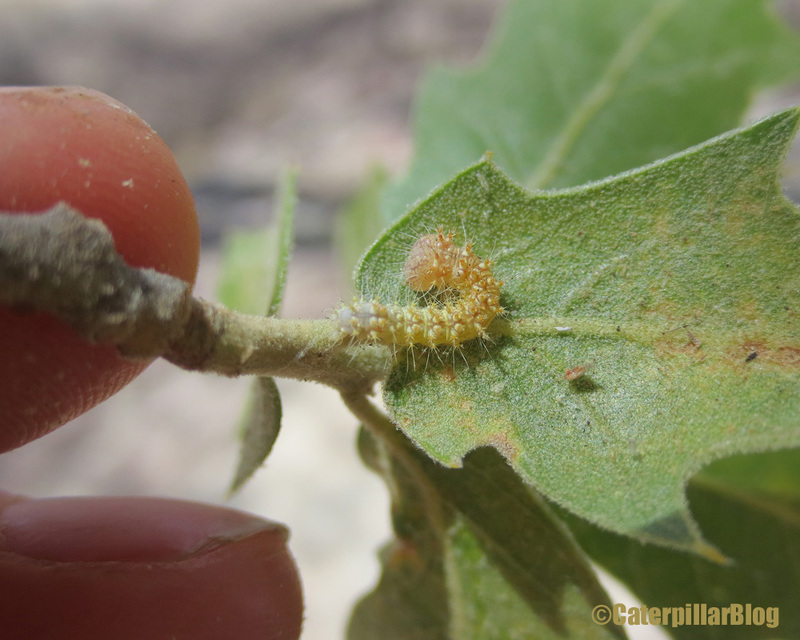 Our first big find turned out to be an Acronicta caterpillar! I spotted it sitting on a branch just above my head. 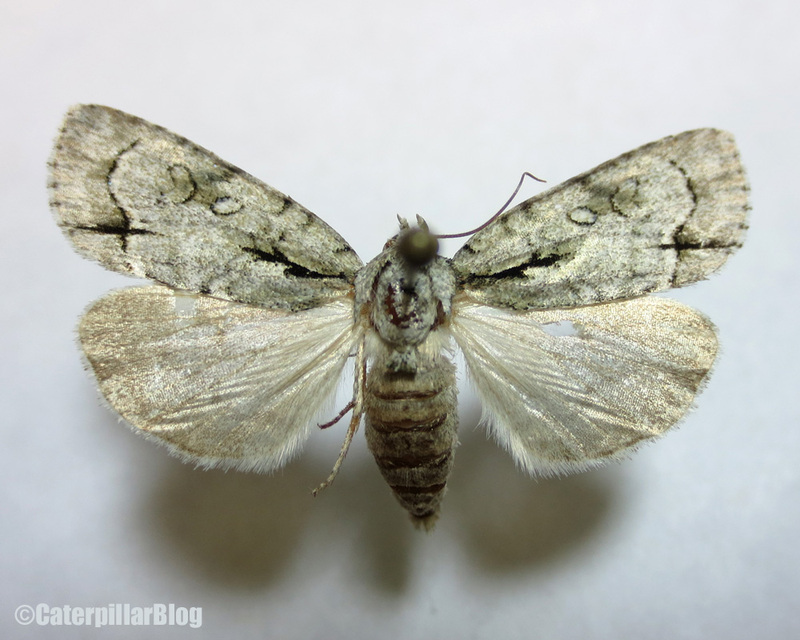 I instantly recognized its fuzzy gray body as belonging to Acronicta lobeliae. But I wasn’t prepared for what happened next. 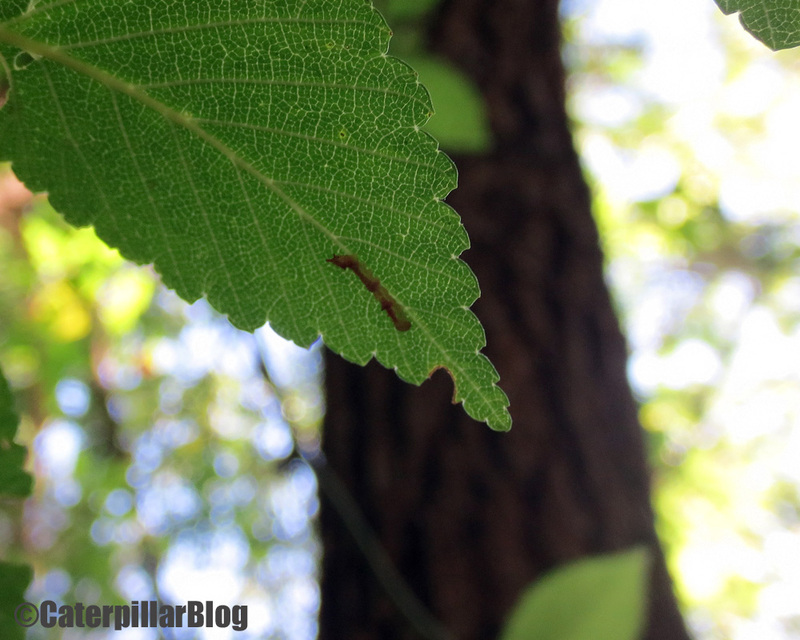 After taking this photo, I reached toward the caterpillar to pick it up. It instinctively dropped to the ground, where it landed directly into an antlion pit! It thrashed around as the antlion tried dragging it under the sand. 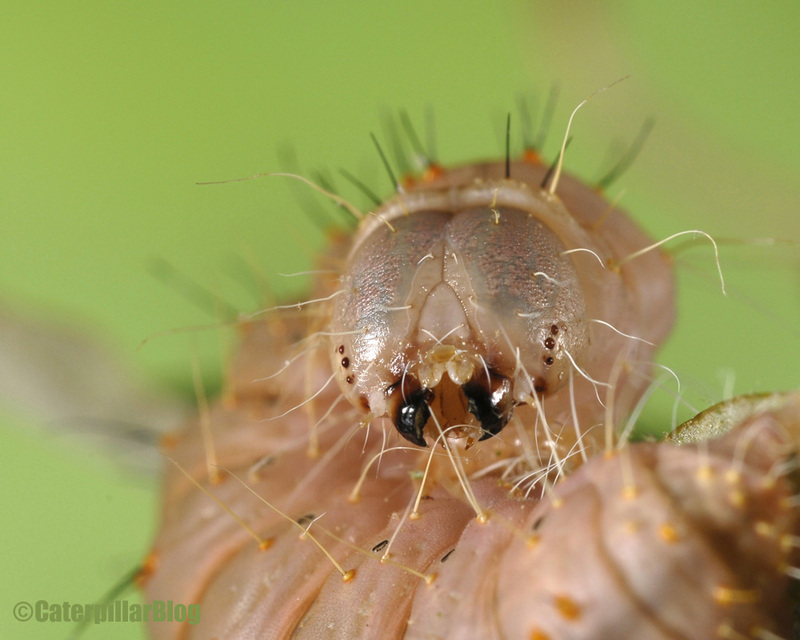 I quickly scooped up the caterpillar but it appeared paralyzed or dead – frozen into a half curled position. I kept the poor guy anyway, and within about an hour it was back to normal. Whew! 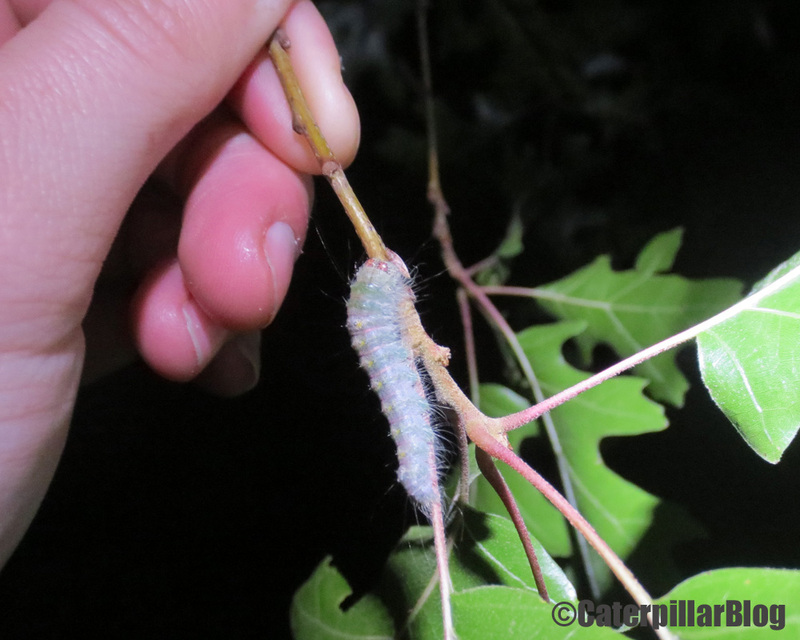 We weren’t blown away by our first night, but I was quite happy to have an Acronicta caterpillar in hand. 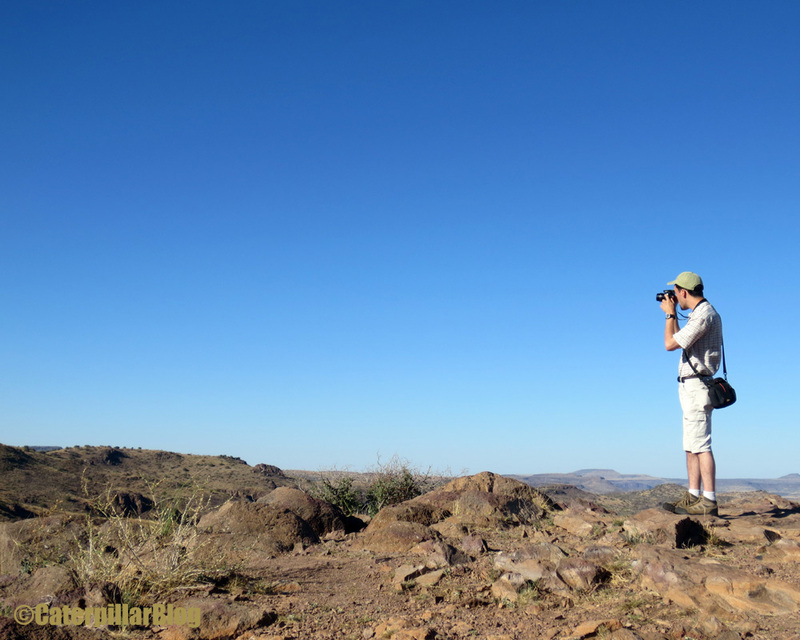 We stayed one night, and the next day continued our journey west, to Fort Davis. 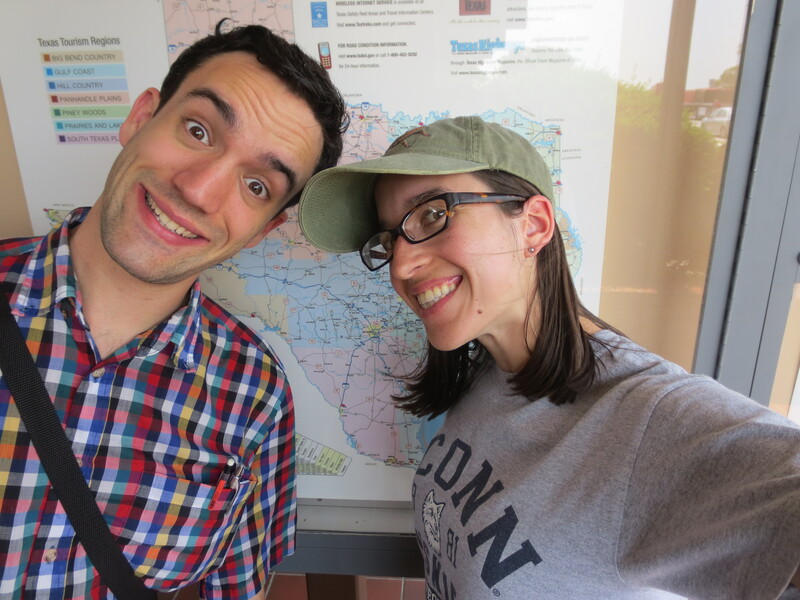 Ben and I are back from our Texas adventure – and what an adventure it was. I have lot of photos to sort and lots of stories to tell. Hopefully I’ll get Ben to help with some of the posts. Summary: we didn’t get the rare species I was looking for, but we got lots of other goodies and met some amazing people. 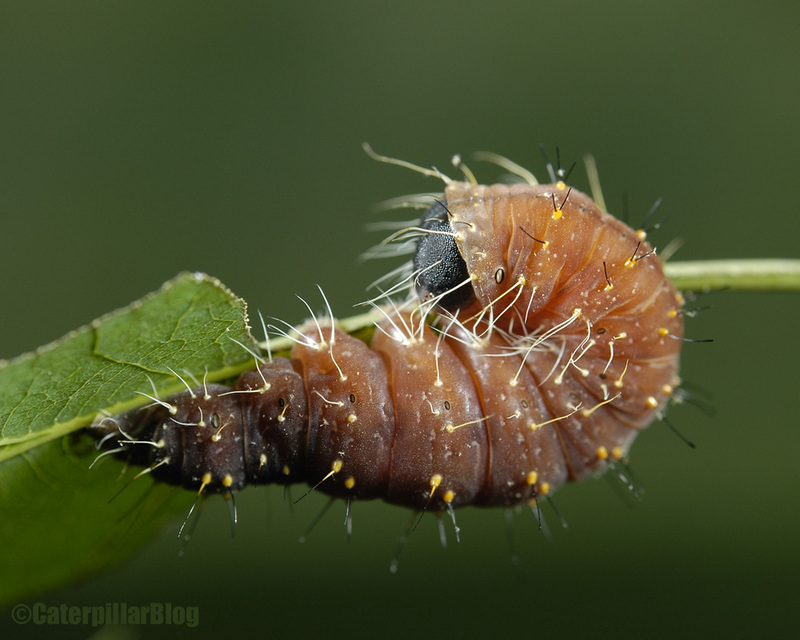 I also have some grand plans to separate my caterpillar life from my sewing/weirdbuglady life. I want to make separate flickr accounts, deviantart accounts, twitter, etc. I feel like I should make my presence less of a mish-mash of everything in my life, and organize into the two main camps: research vs. art. There will be overlap at times, sure, but I’m going to try my best. So… we’ll see how that goes. I’m going blacklighting and gas-station hopping tonight, so I’ll get started with Texas posts tomorrow!